According to the Morse Society, Sally was born on 24 Mar 1805 to David Morse and his second wife Sarah Lathrop in Sharon, Vermont. Indeed Sally’s headstone in Burke, New York gives that as her birth date. Sally Morse’s grave in Burke Center Cemetery. Sally’s obituary states: “In Malone (NY) Aug. 23rd, Mariah Morse, relict of the late Samuel Pond of Burke (New York), died aged 85 years 5 months. Deceased was born in Sharon, VT, March 24, 1805, and moved with her parents to Chateaugay, this County (Franklin County, New York) in 1809.” It also indicates she moved to Burke, NY around 1830. Obituary from the Franklin Gazette (Malone, NY), Friday August 29, 1890. We do, indeed, see David Morse in Sharon, VT in the 1800 Census, then in Chateaugay, NY in the 1810 and 1820 Census, so that fits perfectly with what the obituary says. It was very common for elderly women to live with one of their children after their husbands passed away. David Morse was, according to his death notice, a “patriot of the revolution”. He was also listed as a veteran in the 1840 census for Johnstown, New York. David’s wife Sarah Lathrop received pension payments of $96/year for her husband’s military service (wherein he is also described as a sergeant). The payments stop after a final payment in March 1857, and no payment is made in September 1857. Sarah Lathrop Morse died in Burke, NY on 2 Jun 1857 (between the pension payment that was made and the one that was not made). She was buried in Burke. From this, we know the Sarah who died in Burke and had been living with Sally is the same Sarah who had been married to David Morse. This, to me, firmly establishes the link of Sally Morse Pond to David Morse and Sarah Lathrop. On the other side of this, evidence-wise, is a copy of a birth record from New Hampshire which shows a Mariah Morse born to Benjamin Morse and his wife Abigail exactly one year earlier on 24 Mar 1804 in Haverhill, New Hampshire. This Benjamin Morse married Abigail Emery in Orford, New Hampshire on 31 Dec 1799, and had at least six children in Haverhill. There is a Benjamin Morse in the census for Sharon, VT for 1800 with two sons and two daughters, but this Benjamin Morse was having children in that town as early as 1791 (Son Henry Morse, alongside Benjamin in the 1840 census, was born in Sharon on 16 Jun 1791). This rules him out as the Benjamin who married Abigail Emery and moved to Haverhill. The Benjamin from Haverhill seems to have stayed in New Hampshire; he is in the Haverhill Census for 1800 and 1810, and in the 1850 census for Concord, New Hampshire living with his daughter Harriet (who was born in Haverhill). We have seen that our Sally Morse moved to Chateaugay in 1809, whereas Benjamin Morse is in the 1810 Census for Haverhill with three young daughters. We also have birth records for three daughters born to him in Haverhill between his marriage and 1810, one of whom is Mariah Morse. So it would seem from this that the Mariah Morse who was born in Haverhill was still there with her parents in 1810, not in Chateaugay, New York with David Morse. This makes unlikely the idea that she was born to Benjamin in Haverhill, but then went to live with David in Chateaugay as an adopted child. Going back to Sally’s birth… she was said in her obit to have been born in Sharon, VT on 24 Mar 1805. David Morse is indeed seen in the 1800 Census for Sharon, Vermont with his first wife Esther Larabee. Esther died 31 Dec 1803 in Sharon (her death was recorded in nearby Royalton, VT), and David married Sarah Lathrop on 21 Feb 1804 in Sharon, VT according to the Morse Society. So that aligns well with them having a daughter a year later in March, 1805. Sally, for her part, gives her birthplace as “Vermont” in the 1850, 1860, 1870, and 1880 Census records. She certainly believed she was born in Vermont and not in New Hampshire. I believe at this point that the name and birth day are a coincidence, and the Mariah Morse born in New Hampshire is not Sally Maria “Mariah” Morse. Records recently discovered for my Hoge family in Kreis Cammin and Kreis Greifenberg in Pommern (Pomerania) Prussia. Map showing several of the places where records have been found for the Hoge family in Pommern, Prussia. Nr. 4. Marriage of Carl August Kiesow, feldwebel (sergeant), evangelical religion, from Trechel, Kreis Naugard, Pommern, son of Christian Kiesow, sexton and school-teacher and Magadlene née Bublitz, age 34, and Henriette Charlotte Sophie Kühn, evangelical religion, daughter of Carl Gottfried Kühn, former scharfrichter (executioner) and Elisabeth née Fuchs, age 36, marriage in Stargard 31 Jan 1826. Nr. 11. To Johann Friedrich Wilhelm Hoge, miller in Kambz (Kreis Cammin, Pommern, Prussia) and Charlotte Henriette Tugendreich Hartwich, a son Carl August Wilhelm Hoge, born 19 Jul 1833 and baptized 4 Aug 1833. Godparents: 1. Gottfried Habeck, master tailor in Trechel (Kreis Naugard, Pommern, Prussia, due south of Gülzow). 2. Johann Hartwich, herdsman in Rottnow (Kries Greifenberg, Pommern, Prussia). 3. Justine Caroline Buntrock née Hoge from Pribbernow (Kreis Cammin, Pommern, Prussia). Nr. 19. 1834. To the kossäth David Friedrich Buntrock and his wife Justine Caroline Sophie Hoge a son born 21 Oct 1834 in Pribbernow, named August Friedrich Buntrock. Godparents: 1) Johann Friedrich Hensel. 2) Johann Tesch. 3) Marie Elisabeth Kickhäfer, all from Pribbernow. Nr. 20. Pribbernow (Kreis Greifenberg, Pommern, Prussia). Justine Caroline Sophie Hoge, wife of the Kossäth (peasant farmer) and tischlermeister (master furniture-builder) David Friedrich Buntrock died shortly after child-birth on 21 Oct 1834 leaving a widower and minor son, at the age of 21 years and 3 months, and was buried on 24 Oct 1834. Nr. 22. Pribbernow (Kreis Greifenberg, Pommern, Prussia). August Friedrich Buntrock, son of the Kossäth (peasant farmer) and Tischlermeister (master cabinet-maker) David Friedrich Buntrock and his deceased wife Justine Caroline Sophie Hoge from Kamtz, died at his grandparents home on 5 November and was buried on 9 Nov 1834 at the age of 14 days. Nr. 12. To Christian Friedrich Hoge, day-laborer in Stuchow and Henriette Friederike Kiesow, a daughter, Caroline Wilhelmine Florentine, born on 18 Jun 1836 in Stuchow, and baptized on 3 Jul 1836. Godparents: 1. Wilhelmine Florentine Kiesow, Einlieger’s (worker and lodger) daughter in Schwessow. 2. Friederike Louise Neitzel, married miller Kuesell in Stuchow. 3. Friedrich August Heinrich Kiesow, farmhand in Schwessow. Nr. 5. To Johann Friedrich Wilhelm Hoge, windmill-operator from Kambz, and Charlotte Henriette Tugendreich Hartwich, a son, Wilhelm Gotthilf Erdmann, born on 24 Feb 1838 in Kambz, baptized on 4 Mar 1838. Godparents: 1. Carl Friedrich Hoge, wind miller in Kambz, grandfather of the child. 2. Wilhelm Gotthilf Schlesener, shepherd in Kambz. 3. Wilhelmine Friederike Naatz, farmhand’s daughter in Kambz. Hanna Friederike Wilhelmine Hoge from Stuchow was confirmed on Jubilate (6 May) 1838 in Wittenfelde, age 14 years, 0 months. August Gottlieb Hoge, küster (sexton, church warden) in Wittenfelde, age 24, married on 16 Nov 1838 Caroline Friederike Riebe, age 21, daughter of the deceased töpfer-meister (master potter) Riebe in Gülzow. Nr. 11 & 12. To Christian Friedrich Hoge, day-laborer from Stuchow, and Henriette Friederike Küsow [Kiesow], twin girls, Emilie Amalie Henriette Hoge and Johanne Albertine Friederike Hoge, both born 3 Jul 1838 and baptized 4 Jul 1839. Emilie was born at 8am and Johanne at 10:30am in Stuchow. Godparents for Emilie: 1. Carl Friedrich Tank, Cartwright in Stuchow. 2. Hanna Maria Gurms née Voelz from Stuchow. 3. Henriette Hartwig wife of the miller Hoge in Cambz. Godparents for Johanne: 1. Johann Eggert, joiner in Stuchow. 2. Anna Catharina Jüch wife of Kosäth Böhlke in Stuchow. 3. Johanne Charlotte Streye, daylaborer’s daughter in Stuchow. Johann Ferdinand Friedrich Wilhelm Hoge from Stuchow was confirmed on Sunday Misericordia (10 Apr) 1842 in Wittenfelde, age 14 years/27 days. Christian Friedrich Hoge from Stuchow was confirmed on Michaelis 1844 (29 Sept 1844) in Stuchow, age 13 years/10 month/13 days. Nr. 130. To Friedrich August Heinrich Kiesow, ackenbürger (citizen farmer), and Dorothea Friedricke Goetsch, a son born 9 Dec 1845 and baptized 21 Dec 1845 named Hermann August Heinrich Kiesow. Godparents: 1) The Heinrich Goetsch from Ribbekardt. 2) The kunst Carl Hoge from Stuchow. 3) The ?? Hoge from Carlshof (Karlshof, Kreis Cammin, Pommern, southeast of Gollnow). Henriette Friederike Wilhelmine Hoge from Stuchow was confirmed on Palmarum (28 March) 1847 in Wittenfelde, age 14 years/1 month/7 days. Nr. 122. To Friedrich August Heinrich Kiesow, ackerbürger (citizen farmer), and Dorothea Friedrike Goetsch, a daughter born 13 Oct 1848 and baptized 26 Oct 1848 named Bertha Emilie Henriette Kiesow. Godparents: 1) Friedrich ?? Krause. 2) The wife of the ackerbürger Müller née Berg. 3) Miss Hanna Friedricke Hoge in Diensten hier (in domestic service to someone here in Greifenberg). Nr. 10. August Friedrich Wilhelm Büge, kürschner (furrier) from Stettin and Miss Hanna Friedricke Wilhelmine Hoge from Broitz (east/north-east of Greifenberg), daughter of the miller Christian Friedrich Hoge from Stuchow, were married on 2 Apr 1855 in Broitz (Kreis Griefenberg, Pommern, Prussia). To August Friedrich Wilhelm Büge and Johanne Friedrike Wilhelmine Hoge, a son, born 7 Jun 1859 and baptized 3 Jul 1859 at St. Gertrude, Stettin (Kreis Stettin, Pommern, Prussia), named Johannes Paul Emil Büge. I’ve been having a researcher look for specific records for my Prussian family in the Pomeranian Archives at Greifswald, Germany. One that was recently discovered dates back to 1691 and involves my 8x great-grandfather Jürgen Buss. For those not familiar with terms like “8x great-grandfather”, Jürgen was the great-great-great-great-grandfather of my great-great-grandmother Bertha Kamrath. 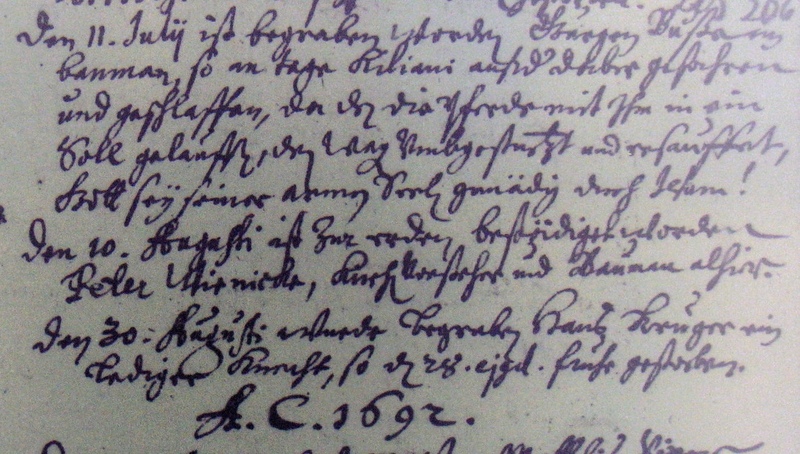 The record from the parish of Roggow A (circled on the map below) documents his burial in the town of Meesow, Kreis (county) Regenwalde, in Pommern (Pomerania), Prussia. 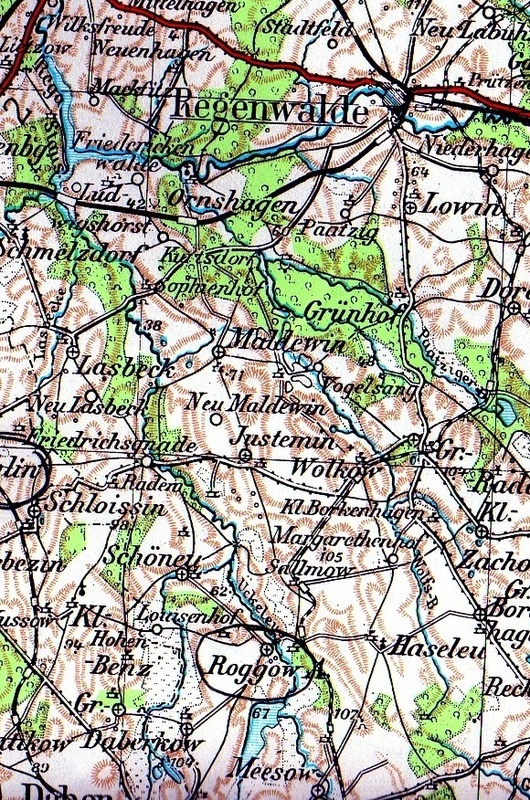 This map shows Meesow at the very bottom with Regenwalde at the top. I never would have guessed that we’d have any record at all of my family living in Prussia in the 1600’s, much less a record with this level of detail. Normally burial records, especially older ones, simply say “This person died on this day and was buried on this other day.” More recently (e.g. in the 1880’s or 1890’s) you will find things like the cause of death, names of parents (for children) or spouses (for adults), and a cursory description of the next of kin (e.g. “the widow and two sons were left behind”). I’ve never seen an older entry with this kind of detail in all the tens of thousands of records I’ve looked at, so I think the person writing it was as intrigued by the circumstances we are today. On 11 Jul 1691 was buried here (in Meesow) Jürgen Buss, baumann (farmer) in Meesow, who died “am Tage Kiliani” (on St. Killian’s day, 8 Jul 1691) when he fell asleep while driving a wagon and the horses ran with him into a “suhle” (marshy pond). The wagon overturned and “versauffet” (sank, and he drowned). “Gott sei seiner armen Seele gnädig durch Jesum!” (May God through his son Jesus have mercy on his soul!). I’m sure there’s more to this story, but we’ll probably never know. I imagine him having a few too many drinks to celebrate St. Killian, perhaps. In any case, Rest in Peace Grandpa Jürgen Buss. I came across this today. 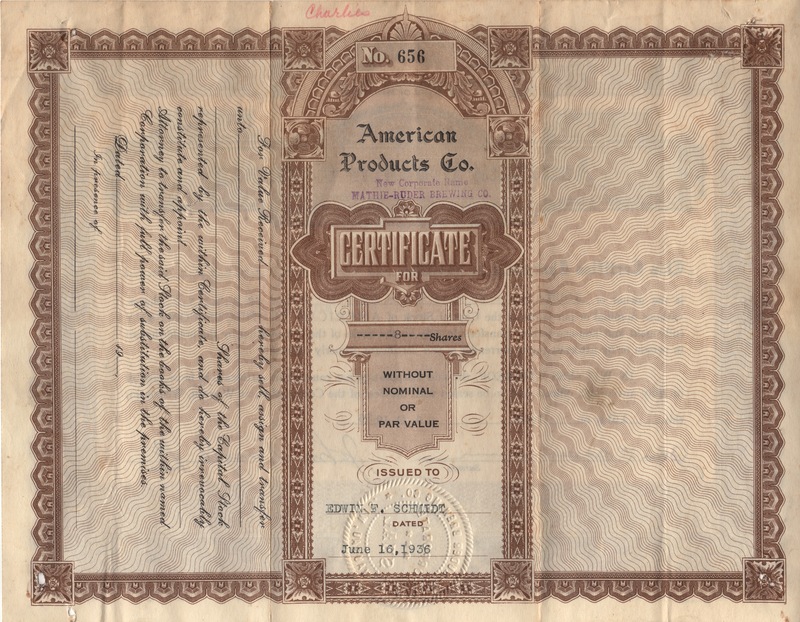 It’s 8 shares of stock in the “Mathie-Ruder Brewing Company” of Wausau, Wisconsin previously owned by my great-grandfather Edwin F. Schmidt. I remember pulling this out of my great-grandfather’s house when I was a kid. My grandmother, my cousin, and I had gone up to Rothschild, Wisconsin to help clean out my great-grandmother’s home when she was moving to a retirement community. I was probably about 12 years old at the time. I had no idea I still had the certificate until I found it in an envelope today in my storage area. 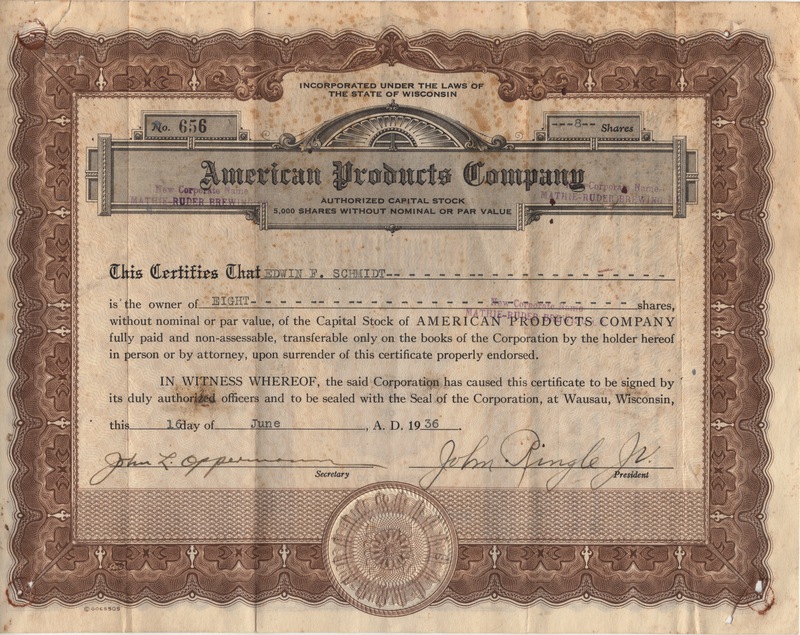 It is dated 16 Jun 1936 and is signed by John L. Opperman (secretary) and John Ringle Jr. (president). Like all things, no matter how obscure, the Mathie-Ruder Brewing Company has a Facebook Page. I found this rather large, lovely photograph on eBay. It wasn’t cheap, but I couldn’t overlook its historical significance. 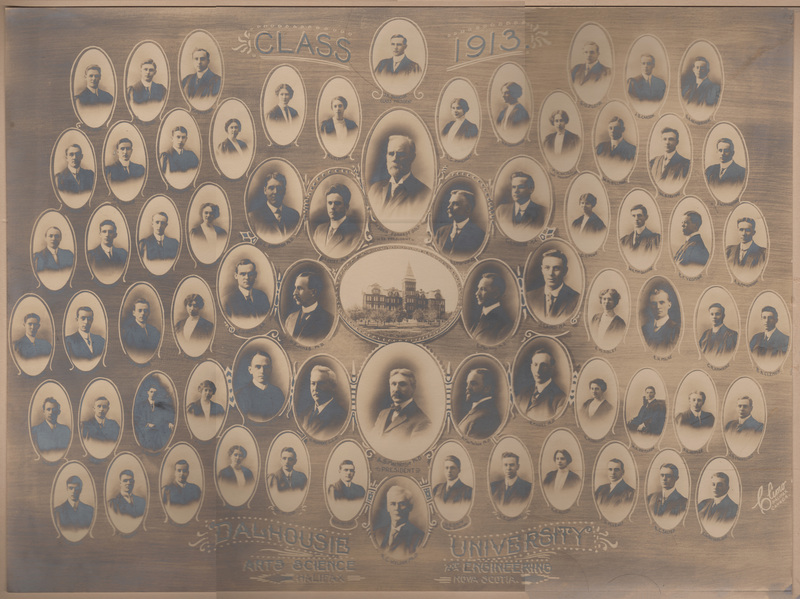 Not to mention the fact that the man in the top center of the photograph with the large portrait is my great-great-grandfather John Forrest (1842-1920), former president of Dalhousie University in Halifax, Nova Scotia. The portrait was prepared by the Climo studio in Halifax. The photo of my grandfather is similar to ones we already have, but not identical, so it is a new bit of information about him. Some of the names are very faded, so I will post them here. There are six rows (roughly horizontal), and I have marked the women with an asterix. Top row: C.G. Smith, L.K. 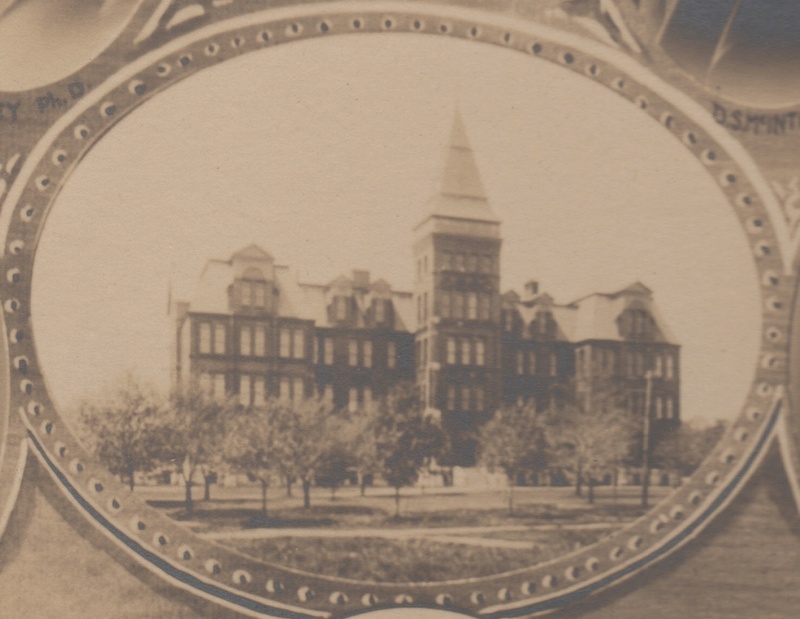 Smith, M. Ferguson, J.K Swanson Class President (center), G.D. Floyd, J.B. Carlson, G.H. Henderson. 2nd row: W.R. Auld, J.O. Irving, A.R. Yeoman, J.S. McDonald *, M.M. Currie *, M.L. Clayton *, L.C. MacKinley *, V.P. Cunningham *, M.W. Nicoll Vice President Class *, W.M. Billman, W.S. Irving, J.W. MacArthur. 3rd row: O.J. Morrison, D.A. Guildford, C.A. MacKay, M.I. MacIntosh *, N.L. Bronson Ph.D., J.A. Estey, Ph.D., John Forrest, D.D. Ex-President, D.S. McIntosh M.S., C.L. Moore M.A., C. Crowe *, W.A. MacQuarrie, R.F. Yeoman, A.H. MacKinnon. 4th row: T.F. McLellan, D.S. McCurdy, W.S. Irvine, H. Steeves *, C.D. Howe S.B., M.P. Jones Ph.D., E. MacKay Ph.D., J. Laird M.A., G.M. Sibley *, E.H. Milne, C.R. Hawkins, R.A. Clemen. 5th row: W.A. Grant, S.W. Gray, C.B. Henry, J. Fraser *, M. MacNeill M.A., H. Murray L.L.D., A.S. MacKenzie Ph.D. PRESIDENT, A. MacMechan Ph.D., R. Magill Ph.D., K. Morrison *, H.K. 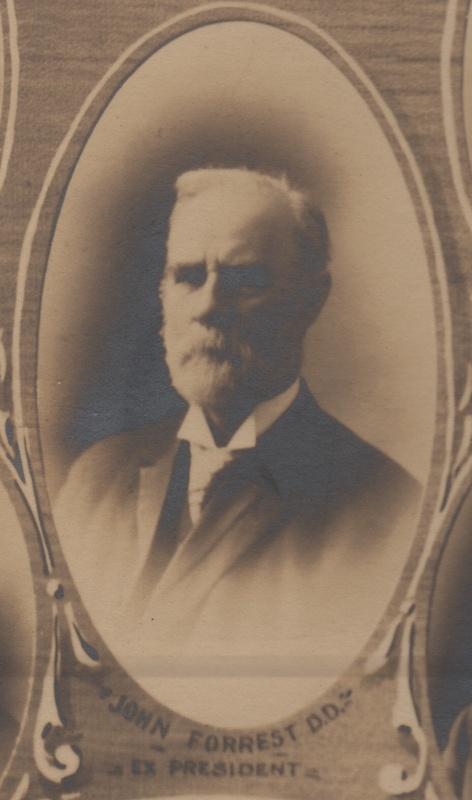 MacMahon, F.A. Heffler, J.R. Cornelius. Bottom row: J.B. Dickie, F.D. Graham, N.E. MacKay, A.L.B. Umlah *, McI. McLeod, W.M. Nelson, R.C. Weldon Ph.D., H.A. Smith Class Secretary, L.B. Campbell, K.E. Allen *, G.M. Lewis, B.C. Salter, C.G. Sutherland. 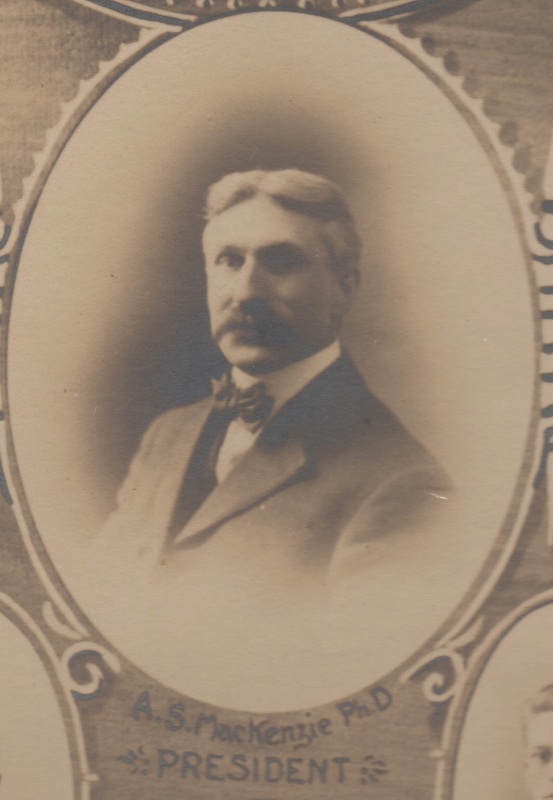 Dr. Arthur Stanley MacKenzie, Dalhousie President from 1911 to 1931.